We are the future of Public Health. Bold words coming from a bold college whose mission to ensure lifelong health and well-being for every person, every family and every community in Oregon and beyond is enhanced through its recent national accreditation. 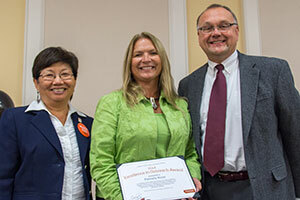 As the first accredited college of public health and human sciences in Oregon, CPHHS faculty and staff are the backbone behind the college’s past achievements and those to come in the future. This year, the CPHHS All-college Meeting in September was more than a meeting. It was a celebration of the hard work put forth by faculty and staff who have helped the college achieve its dream of becoming accredited. Attendees were welcomed with a grand entrance, given college swag and treated to breakfast before CPHHS Dean Tammy Bray and other college leaders took the stage to discuss highlights of the year and plans for the future. 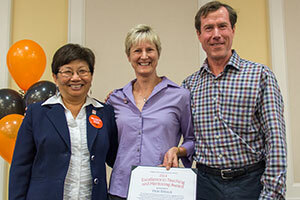 They also honored the hard work put forth by college faculty and staff through annual awards. Special this year, two undergraduate students were recognized with a college award for their work raising awareness of the college’s accreditation and Health Extension across Oregon. 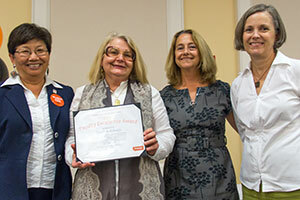 In addition to college awards, Oregon State University honored the entire college, namely the college’s accreditation team, as this year’s Beaver Champion Award recipient. 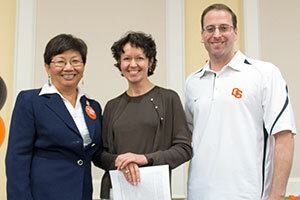 CPHHS Associate Professor Adam Branscum was named the Promising Scholar Award recipient. Read on to learn more about the college’s 2014 outstanding faculty and staff. In recognition of her leadership and long career with Cooperative Extension Service, for her commitment to youth development and health, for her service to internal and external committees and organizations, and for her dedication to creating the next generation of leaders. For her dynamic teaching style and ability to create an engaging, secure and supportive classroom environment that fosters joy in learning; for her positivity, compassion, enthusiasm, sincerity and depth of caring; for her work in self-compassion, mindfulness and promoting physical activity; for her positive mentorship of students; and for her leadership and service, including serving as the EXSS Graduate Coordinator and co-chair of the EXSS Task Force. 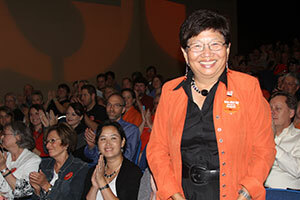 For her excellence in scholarship, publication and service; for her tireless commitment and passion for health and healthy aging; for her willingness and ability to communicate science to the public; for her work as a supportive adviser and mentor; and for her commitment to underrepresented groups and international students. For creating meaningful relationships with faculty, students and the families and children of IMPACT, IMPACT for Life and the MS Program; for her positive attitude and friendly personality; for her commitment as Food Drive coordinator; for her willingness to develop new skills; and for going above and beyond to serve others. For their commitment, perseverance, passion and dedication to improving the health of people in Oregon and beyond. Their statewide journey raised awareness for the college and university, the impact of its Health Extension and the importance of physical activity. 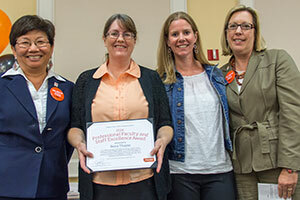 The Beaver Champion Award was given the accreditation team in the College of Public Health and Human Sciences (Tammy Bray, JoAnne Bunnage, Marie Harvey, Mark Hoffman, Roger Rennekamp and Sheryl Thorburn) as well as the entire college’s faculty and staff. 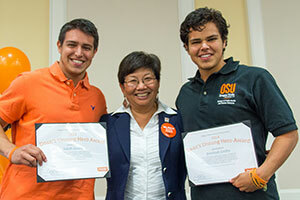 The Promising Scholar Award recognizes junior faculty whose outstanding scholarship has been recognized by peers, and who have demonstrated a high level of accomplishment over a relatively short period of time at OSU. For his valuable contributions to Oregon State, Adam Branscum, associate professor in the College of Public Health and Human Sciences, is the 2014 recipient of the Promising Scholar Award.